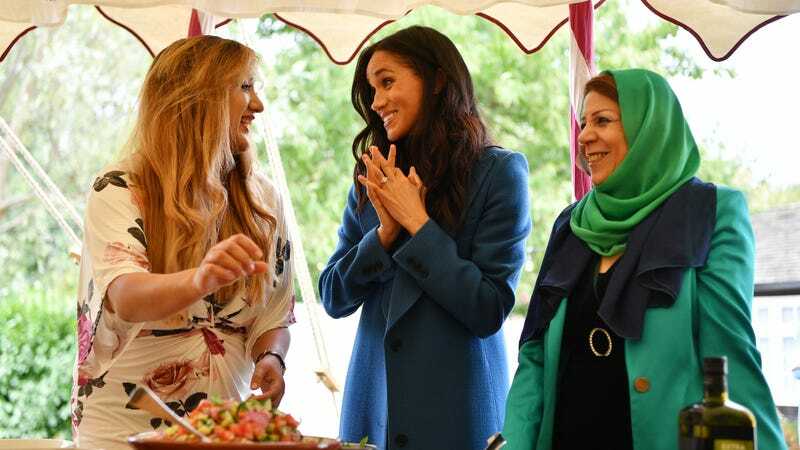 Meghan, Duchess of Sussex, used to have a food blog, but now that she’s royalty and not a member of the cast of Suits, her food-related pursuits have somewhat changed in nature. In her first public speech as a member of the ol’ Windsor clan, she celebrated the release of a cookbook she helped bring about, but the recipes aren’t hers. They’re the work of the women of Hubb Community Kitchen. Time reports that the kitchen is run by “a group of displaced Londoners who came together to cook for their families and neighbors in the wake of last year’s Grenfell Tower fire.” It includes over 50 recipes. I said in the foreword that this is more than a cookbook, and what I mean by that is the power of food is more than just the meal itself. It’s the story behind it… When we get to know the story of the recipe, you get to know the person behind it. That’s what we’re talking about in terms of coming together to really engage and talk and to be able to celebrate what connects us rather than what divides us. That, I believe, is the ethos of Together. The recipes in Together: Our Community Cookbook run the gamut from mint tea to coconut chicken curry, and obviously, it’s for a good cause. If the women of Hubb sell 50,000 copies of the cookbook, they’ll be able to keep the kitchen open seven days a week. You can pre-order it here; the book will be released on September 25.